"Designing our cafes tends to go along two tracks," said former director of cafe design Arion Paylo. "Some have a very clear narrative around how we think about them. Some happen more organically. But the World Trade Center cafe was in a class of its own." For the Blue Bottle cafe design team, vision is important; daydreaming, scouting, and plenty of vision boards come standard. But as they set out to design the cafe that will soon be opening at 4 World Trade Center (built by our trusted partners at Bohlin Cywinski Jackson), they knew it was more important than ever to be mindful of what they wanted to accomplish. Located across the street from the National September 11 Memorial Plaza, the cafe faces a site that holds painful and complicated meaning for Americans in general, and New Yorkers in particular. 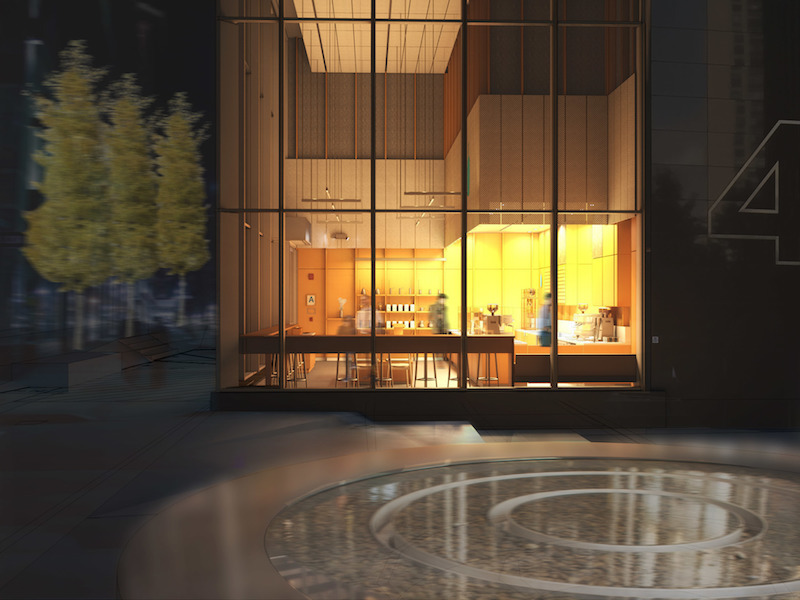 Through its glass facade, guests and baristas alike will overlook the brightly lit fountain engraved with the names of all who were lost in the terrorist attacks of February 26, 1993, and September 11, 2001. Doing justice to the location while providing a place of refuge—and coffee—for all who ask for it was a task that Arion and his team knew was going to be challenging. "We want Blue Bottle to be there for the people who visit as well as for the people who work in the neighborhood, while also being respectful of the completely unique place that it is," said Arion. "We're well aware of how close we are to a place of mourning and memory." "To make sure it's a calming space, we tried to use humble materials in an interesting way, looking to eliminate distraction," said Arion. This was already a tall order in a metropolitan hub where tourists, commuters, and workers stream down packed streets into the bustling Westfield World Trade Center and Oculus structure. But the thirty-foot ceilings, broken up into a satisfying triptych—"Strong composition, like a good photograph," said Arion—feel like a glass cathedral, giving an impression of airiness that's somehow both intimate and warm. Comfort, of course, is key to calm. The design team chose those glass windows only after extensive sun studies to be sure baristas and guests won't get overheated during the day. Those who will be visiting the cafe with friends and family can expect that comfort to extend to the auditory, as well. "We've thought a lot about acoustics," said Arion. "We used an enormous amount of acoustically absorbent material in the space, though you probably wouldn't even notice it. We do this so echo is minimized, meaning it's easier for people to have conversations with each other. We combat the glass and concrete surfaces with soft, absorbent ones." Another aspect of comfort is seating. Made by Japanese manufacturer Maruni, the Hiroshima chair is made with wood from another world-famous site of tragedy. Like this simple, comfortable furniture, it's our hope to continue in Maruni's tradition of making beautiful things from the ruins of disaster. New York City, known for its grandeur and diversity, its size and skyline, is often talked about as a larger-than-life fantasy, put on a level where humans don't even seem to exist. But the people of NYC are what make it great, and Arion's focus on people-centric cafes comes through when he talks about the World Trade Center cafe. "Though it's tall and dramatic, we wanted to create a more human scale," he says, to strike the balance of beauty and simplicity with softness and humanity. "Hopefully," said Arion, "this new cafe serves as both reprieve and place of reflection, a space for people to just be."